No one DISC style determines how successful an individual will be. Our personal bias, however, affects how we perceive the world and what we believe creates success...including what DISC Styles create success. A couple of years ago I received a call from a consultant who was using the Extended DISC assessment tool with one of his clients. He was in charge of a project to help a client identify the behavioral requirements of a successful store manager. While the top management was reasonably satisfied with the performance of most of the stores, it also believed that many of the managers were doing only a mediocre job. However, no one was quite sure how to best improve their performance. Personal bias on what makes a successful store manager differed throughout the entire organization. The client was a furniture retail chain in the South. It was a family-owned business. The company had been in business for almost 80 years and was doing well, with sales of about $200 million and growing steadily. Change was about to take place. The company’s CEO was going to retire soon and his son was going to take the helm. The transition was expected to be fairly smooth because the son had been involved in the business from an early age. Most of the employees knew him or at least of him. Also, everyone had always known that this hand-off of the leadership position would eventually take place. The father had been in the same position 35 years ago as he took over from the founder of the company – his father. The father and the son were quite different. Although both were very committed to the success of the business, their leadership styles were almost opposite. The father was very outgoing and gregarious. He seemed to have endless energy that he expressed freely. The son, although likeable enough, was analytical, systematic and more difficult to get to know. The father, the son and the top four store managers were asked to participate in the assessment. The results of the assessment revealed that the father and the son perceived the ideal store manager behaviors to be almost opposite. Father believed the best style of manager should be outgoing, talkative, enthusiastic, persuasive, animated and energetic. He believed – and we see this happen often – that the ideal store manager essentially should be like him. After all, he was successful. His results indicated that the best kind of manager was an I-style in our model (see the dot in the bottom right quadrant on the image shown). The son, on the other hand, deemed the ideal style to be analytical, logical, precise, systematic and more cautious. 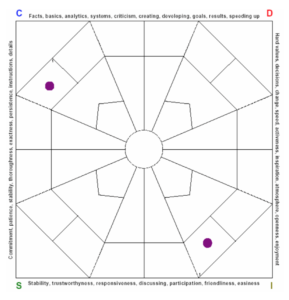 His results indicated that the best kind of manager was a C-style (the dot in the top left quadrant). However, the most startling finding was that none of the top store managers could define the ideal store manager. Consequently, their assessment results were what we often call a “flat-line”. It indicated that the store managers perceived the ideal style manager should be able to do it all – they should be able to demonstrate all behavioral styles at the same time. Obviously, it is an impossible feat. The consultant was puzzled. How could all of the top store managers generate the same type of results? Further discovery revealed that both the father and the son visited the stores often. It was part of the culture to “visit the troops” often. When the father showed up, it was always a party atmosphere. He would enthusiastically talk to everyone, shake their hands and ask questions about the employees’ family members. “How is your daughter, Sue, doing? Is she still playing volleyball? He did not always get the names and the sports right, but his smile and enthusiasm was genuine. He was also full of fun ideas about how to build excitement at the stores. “Let’s have a sales contest!! The salesperson who sells the most next month will win a weekend for two in Las Vegas. This will be lots of fun!” he would declare cheerfully. Who we are creates a significant personal bias at many levels. It affects how we see the world and what we believe creates a successful individual. To deny this personal bias adversely affects our performance. To be aware of it, we are armed with the knowledge to improve our success. What are your leaders expecting from their employees?